Carolina Leid talks to Spike Lee at Madison Square Garden. 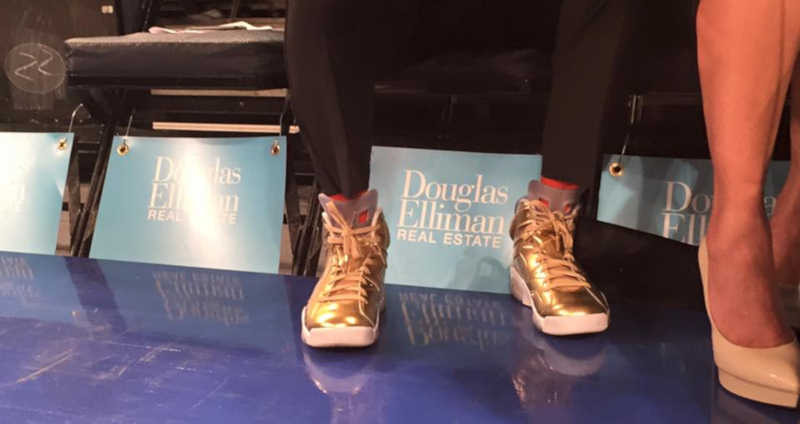 NEW YORK (WABC) -- Two-time Oscar nominee, and this year's honorary Oscar recipient, Spike Lee strolled into Madison Square Garden in a tuxedo and gold one of a kind sneakers. The filmmaker refused to let his Jordans hit the red carpet in Hollywood, instead resting his feet on the hardwood at Sunday night's Knicks game against the Miami Heat. "This is the second year in a row where there had been no people of color nominations and the acting category. That's why we're not there," says Spike. Not a single non-white actor was nominated for an award - sparking boycotts around the country. Spike and his wife, lawyer and filmmaker Tonya Lewis Lee say they could not support the awards ceremony. "We would say good luck to all the nominees - this is hard work. Making films is hard work. Kudos to them," said Tonya. The Academy of Motion Picture Arts and Sciences announced in January that it will take historic action to make its membership more inclusive. "I think Hollywood has noticed. The Academy has noticed - they changed their rules overnight to get more diversity with women and people of color. It can't be ignored," adds Spike. Spike and Tonya say there are so many layers to the problem, and that changes need to start from the top.